On August 21st 1959, President Eisenhower signed a proclamation that added the final 50th star to the old star-spangled banner when he autographed the admission of Hawaii into official statehood. Each year in August (this year it falls on Friday, August 15th) the day is honored a variety of ways with government offices and many businesses closed around the islands so that people can celebrate. Of all the 50 states, Hawaii has some of the best selection of tropical plants and flowers and whether you live on the islands or are landlocked in the Midwest, there’s no better way to acknowledge the day than with the gift of a beautiful hibiscus plant. Turn your own patio into a paradise or add a touch of the tropics to a friend’s with this exotic bloom. Hibiscus are the iconic bloom of our 50th state. Splashed across the print of a Hawaiian shirt or tucked behind the ear of a hula dancer, the hibiscus has come to be associated with the land where the palm trees sway. Native to tropical regions throughout the world, the flower has been cultivated in many countries and there are now hundreds of species to choose from. The flower is large- some almost 6 inches across- and trumpet-shaped with 5 petals and a tall, central stigma and stamen that reaches high above the flower to attract pollinators. When buds bloom they unfurl in a twist of bright red, orange, purple, yellow, pink or white and capture the eye with their splash of color. The official flower of the state of Hawaii, the hibiscus is the blossom worn behind the ear by Tahitian and Hawaiian women to indicate marital status. The bloom is worn behind the left ear if she is married and the right if she is single. Entirely edible, the flower is often dried and used in teas and bright red drinks or made into candies around the world. High in vitamin C with a fruity tartness, it is also used as a natural red food coloring in many products. 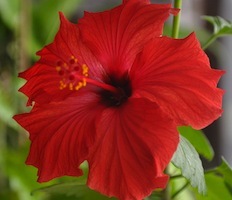 The best way to grow hibiscus is potted in a container either as a shrub or pruned topiary-style into a tiny tree. It grows best outside and can remain there until temperatures start to dip below 35 degrees (F), at which time they will need to be moved inside to an area that receives at least 6 hours of bright sunlight such as near a southern facing window. While a trip to Hawaii may be out of your budget for now, celebrate its fine addition as a state with a hibiscus and transform your state of mind to a tropical paradise.